I love Christmas songs, almost all of them. I admit to liking old-fashioned carols the best, but I like non-religious ones, too. My favorites are the ones that make me feel warm and celebratory and…reminded. Until this year, however, I didn’t give much thought to the origins of those tunes, although I’m sure at one time I knew some of them. Now, thanks to Google and my addiction to the internet, I know some more. What I did was go with the 1st reputable source for each answer here. The oldest Christmas carol is…well, hard to figure out; there’s lots of information out there. The oldest of the ones that are most familiar and in English is “God Rest Ye Merry, Gentlemen,” dating back to at least the 1650s. 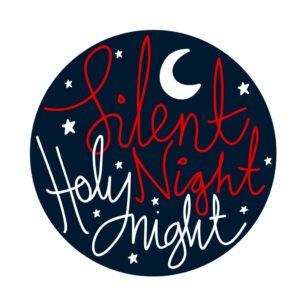 The most popular Christmas carol, according to Time Magazine, is “Silent Night. As of 2014, with “733 copyrighted recordings since 1978, it is nearly twice as dominant as ‘Joy to the World,’ a distant second with 391 records to its name.” It was first written in German in the early 1800s by Franz Xaver Gruber to Joseph Mohr’s lyrics in Salzburg, Austria. The most loved modern Christmas song is “All I Want for Christmas is You,” famously written and recorded by Mariah Carey. I must admit to gagging a little when I read this, because it’s arguably my least loved, but even I liked it in Christmas, Actually. I read another list where it was #28 out of 50, but I had to go with the first source. Sigh. This makes me think of a song from my earliest memory, “All I Want for Christmas is My Two Front Teeth.” My aunt had this on a 78-rpm record, recorded by Spike Jones and his City Slickers. It was written by Donald Yetter Gardner in about 30 minutes after realizing most of his class of second-graders were missing those particular teeth. My own favorite modern song is “Mary, Did You Know,” which can bring me to tears in a heartbeat. Mark Lowry lyrics and music written by Buddy Greene give haunting thought of how the mother of the Christ child must have felt. “Do You Hear What I Hear?” was written by Noël Regney and Gloria Shayne Baker in 1962 as a plea for peace during the Cuban Missile Crisis. I remember hearing it at night when I was a kid and not being able to identify the yearning it woke in me. Since reading the song’s origin, I wonder if that longing was for peace. I still love the song, and I still yearn for peace. In this year’s Christmas Town stories, Anna J. Stewart’s Wally MacIver wrote a new song called “Wishes and Horses.” Music’s just one more gift to readers and to us from the magical town in Maine. We hope you enjoy your visits this year. Do you have Christmas song favorites? Which ones? And better yet, what makes them your favorites?